I recently won a giveaway for adorable fabric from The Intrepid Thread. They have some really unique fabrics in their shop. I am a beginner when it comes to sewing so I was trying to think what I could make that was quick and easy. Embroidery hoops are great for wall decor. Plus you could probably do this project under 15 minutes. Loosen hoops and place fabric the way you want it. Then tighten the screw and make sure fabric is pulled tight. I had to adjust fabric a few times because I wasn't used to working with these hoops. Cut fabric so that there is enough left to glue down. 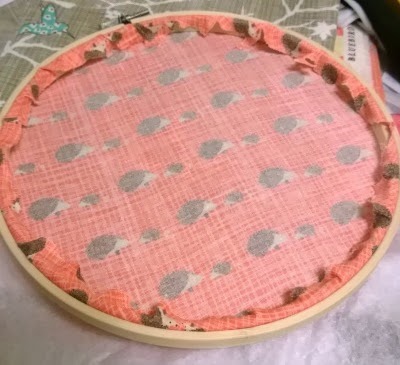 Glue down edges of fabric to back of hoop. Hang on wall of choice. I put mine in the bedroom. I'm going to choose two more fabric designs for the other two hoops. 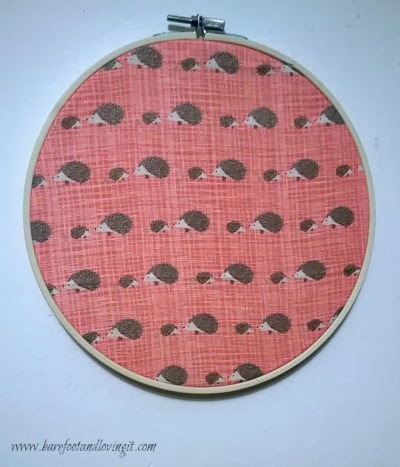 This is a fun project to do with spare or leftover fabric. What do you like to do with spare fabric?